In today’s tutorial, we are going to learn how to implement Monte Carlo Simulations in R.
Monte Carlo simulation (also known as the Monte Carlo Method) is a statistical technique that allows us to compute all the possible outcomes of an event. This makes it extremely helpful in risk assessment and aids decision-making because we can predict the probability of extreme cases coming true. The technique was first used by scientists working on the atom bomb; it was named for Monte Carlo, the Monaco resort town renowned for its casinos. Since its introduction in World War II, Monte Carlo simulation has been used to model a variety of physical and conceptual systems. 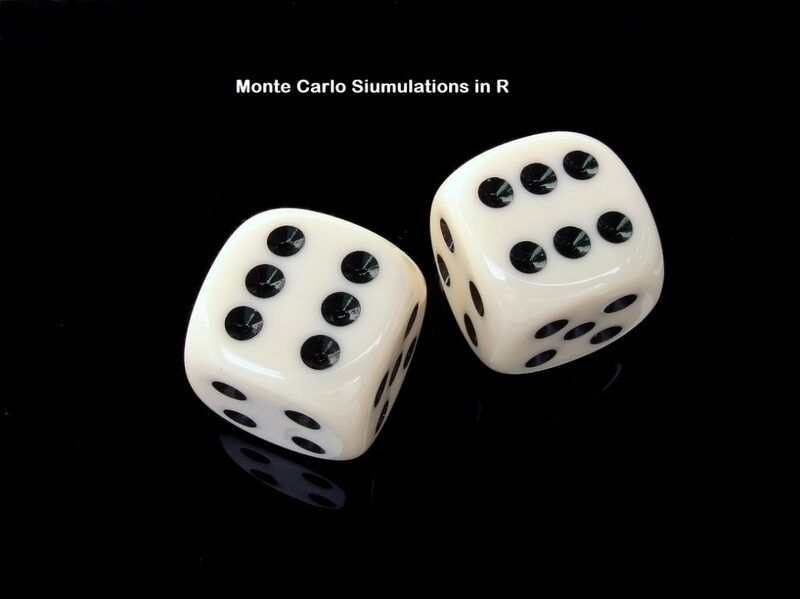 Monte Carlo methods are used to identify the probability of an event A happening, among a set of N events. We assume that all the events are independent, and the probability of event A happening once does not prevent the occurrence again. Basics of MC from software provider Palisade. – link3. Risk analysis. Assume a new product was sold at a loss of $300 to 6 users (due to coupons or sales), a profit of $467 in 79 users and a profit of $82 to 119 customers. We can use Monte Carlo simulations to understand what would be the average P/L (profit or loss) if 1000 customers bought our products. A/B testing to understand page bounce and success web elements. Assume you changed the payment processing system on your e-commerce site. You are doing an A/B test to see if the upgrade results in improved checkout completion. On the old system, 12 users abandoned their cart, while 19 completed their purchase. On the new system, 147 people abandoned their cart while 320 completed their purchase. Which system works better? Selection criteria. Example if we have 7 candidates for a scholarship (Eileen, George, Taher, Ramesis, Arya, Sandra and Mike) what is the probability that Mike will be chosen in three consecutive years? Assuming the candidate list is the same and past winners are not barred from receiving the scholarship again. Probabilistic Results – show scenarios and how the occurrence likelihood. Graphical Results – The outcomes and their chance of occurring can be easily converted to graphs making it easy to communicate findings to an audience. Sensitivity Analysis – Easier to see which variables impact the outcome the most, i.e. which variables had the biggest effect on bottom-line results. Scenario Analysis: Using Monte Carlo simulation, we can see exactly which inputs had which values together when certain outcomes occurred. Correlation of Inputs. In Monte Carlo simulation, it’s possible to model interdependent relationships between input variables. It’s important for accuracy to represent how, in reality, when some factors goes up, others go up or down accordingly. Runs = no of trials or iterations. For our product profit example (application example 2), runs = 1000.
where we are assigning number 1:7 to each student and hence Mike = 7. The code files for this tutorial are available on the 2017 project page. (Link here under Jul/Aug 2017 ) .